Things have been a bit lax on the excitement front of late, hence the pic of today's lunch! If it looks as good to you as it tasted to me, then it was worth hanging out of our second-story office to get a 3G signal in order to upload the pic! There's a little sandwich shop called Sandwich Plus, in Tring's Dolphin Square, that appears to offer the more interesting sandwich fillings in the area. 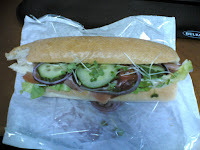 This one was Serrano Ham and Brie, which you can't really see here as it was hidden somewhere under the ton of salad!! I'm not complaining, mind, as it was very tasty ... the same of which could not be said for the salad dodger I passed on the way to buy it. Tonight should be a fun night. My mate Foshie has asked me to attempt to take some pics of his new cat, Molly, under the theory that she won't screw her face up with my camera due to the auto-focus being E-TTL, so there is no auto-focus light. There's only so much a camera can do. For the rest, there's Photoshop!